No, not exactly. 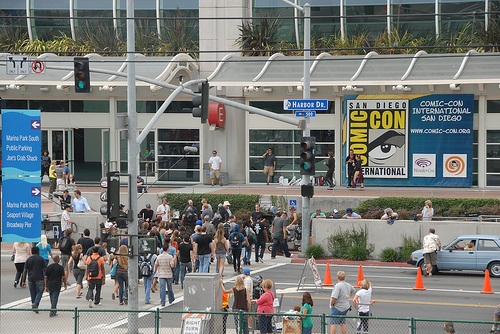 You might see Comic-Con banners back up at the Convention Center as well as what looks like a large Comic-Con crowd on the street today. Don’t panic! You didn’t travel through one of Dr. Strange’s spacetime portals to last month’s Comic-Con; it’s just a movie set. Get ready to see yourself grace the silver screen once again, Diego! Sorry to those hoping for a surprise encore of Comic-Con 2009. 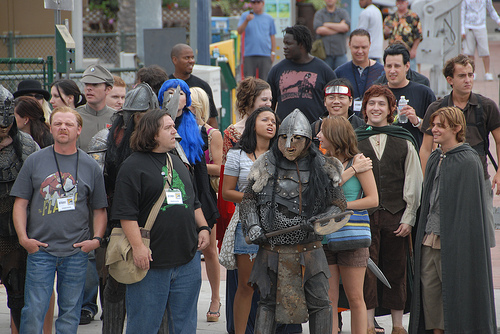 If you want to attend the real Comic-Con, you’ll have to travel through time the regular way with the rest of us and wait until next year — July 22-25, 2010, to be exact. This entry was posted in San Diego Events and tagged comic-con, downtown, film by Guest Blogger. Bookmark the permalink.